Public Safety Minister Ralph Goodale said the van attack in Toronto that killed 10 people and put another 15 in hospital is not part of a plot that poses a threat to national security. Police confirm 10 dead, 15 injured after van strikes pedestrians along Yonge St.
"I've had the opportunity to consult with the senior officials of the security and police agencies of the Government of Canada, and on the basis of all available information at the present time there would appear to be no national security connection to this particular incident," Goodale told reporters in Toronto Monday evening. Goodale was careful not to rule out the possibility that the investigation could evolve, but said that while the attack was "horrendous," current information suggests it was an isolated incident. 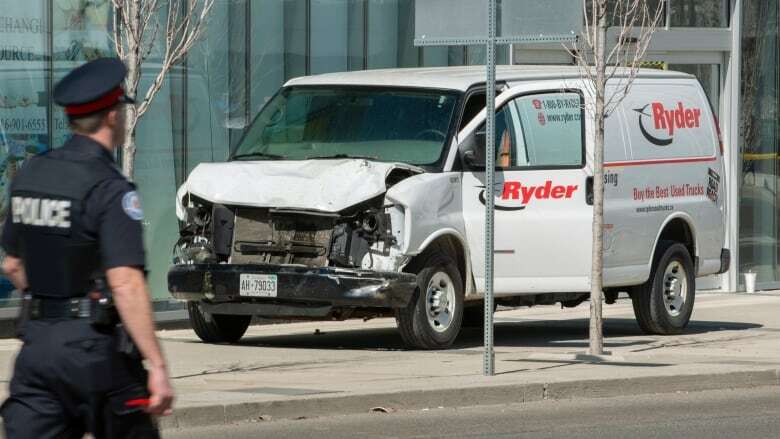 The Toronto Police Service confirmed that the man arrested after a rental van rammed a number of pedestrians near a busy intersection in Toronto is Alek Minassian, 25, of Richmond Hill. According to his LinkedIn page he's a student at Seneca College. In the first hours after the attack, Goodale said in a press conference that he had no evidence to suggest Canada's national threat level needed to be raised. "There is no information available to me at the present time that would indicate a change in the risk level," Goodale told reporters in Toronto, where he is attending the G7 foreign and security ministers meeting. Prime Minister Justin Trudeau also sought to reassure Canadians Tuesday that the incident has "no connection to national security." "Obviously, all Canadians continue and will continue to have questions about why this happened, what could possibly be the motives behind it. As was indicated last night, at this time we have no reason to suspect that there is any national security element to this attack. But obviously, the investigations continue," he told reporters in the foyer of the House of Commons. Goodale said he was meeting with his counterparts in other G7 countries to discuss national security issues when news of the attack broke. He said that all the foreign ministers he was meeting with expressed their support and sympathy over what had happened. Earlier in the day, Goodale used the word "attack" to describe the incident. "Grateful for the brave and professional response of @TorontoPolice and other first responders to the horrific attack at Yonge and Finch," Goodale said in a tweet. "Canadians are appalled at what happened. The victims and their families have our deepest condolences." But a spokesperson for Goodale's office later told CBC News in an email that the minister used the word "to describe [the] scope of violence, not in the terror sense. Speaking to the result not the cause or nature." Prime Minister Justin Trudeau, writing on his official Twitter feed, offered his sympathies to those affected by the incident and also thanked first responders for their efforts. Conservative Party Leader Andrew Scheer and NDP Leader Jagmeet Singh also took to social media to issue their own calls of support for the victims and first responders. Tragic news coming out of Toronto – my thoughts are with all those affected by the horrific events unfolding near Yonge and Finch, along with all first responders. Earlier in the day, when details of the attack hadn't yet been made public, Scheer began question period in the House of Commons expressing his concerns for the victims and asking Trudeau for an update. The prime minister said that he had no details to relate but his thoughts were also with the victims. At about 1:30 p.m., police were called to the north Toronto intersection of Yonge Street and Finch Avenue after a white van struck a number of pedestrians. A witness said that he had seen at least four covered bodies lying on the ground after the event, and that the people hit included a man who was crossing the street and others on the sidewalk. The van, which was said to have mounted the curb before striking pedestrians on the sidewalk, was stopped by city police, Const. Jenifferjit Sidhu told CBC Toronto. National Defence has confirmed that Chief of the Defence Staff Gen. Jonathan Vance was not attending a briefing on the incident, contrary to some reports. DND also confirmed that "the force protection posture of the Canadian Armed Forces has not changed."